A New Antiperspirant and Deodorant That Prevents Underarm Odor in the Popular Ban Block Roll-On Lineup. 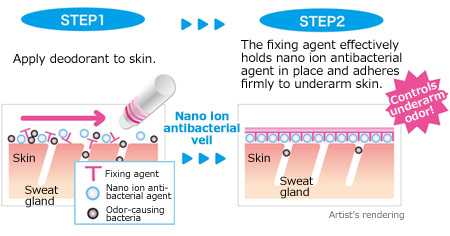 The Nano Ion Antibacterial Agent Stays on Skin Longer For Lasting Freshness, Even at the Most Odor-Prone Moments! 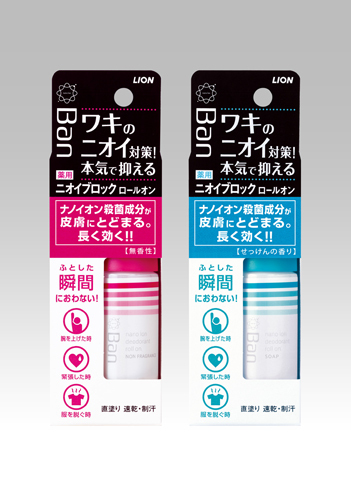 Lion Corporation (President: Itsuo Hama) announces the February 12, 2015 nationwide release of new Ban Odor-Blocking Roll-On Unscented and Ban Odor-Blocking Roll-On Soap Scent. The nano ion antibacterial agent in this antiperspirant and deodorant stays on the skin longer for lasting freshness, even at the most odor-prone moments. Women are entering the workforce in ever greater numbers and as a result are spending more time in the company of others and in stressful environments. At the same time, climate change and the stepping down of air conditioning in an effort to save energy are contributing to increased perspiration. As a result of these factors, more women are worrying about their underarm sweat and odor. Such worries are not limited to summer; even in winter, growing concerns are being voiced about odors arising due to sweating caused by such factors as major differences in day and night temperatures and transiting between outdoor and indoor environments as well as the use of skintight functional underclothes. Accordingly, many women frequently take painstaking measures to address underarm odors all year round. In particular, among women aged 20-39, 89% of survey respondents said that they have experienced being surprised by and feeling self-conscious about their underarm odor. Many consumers experience a momentary awareness of their body odor when removing a garment, raising an arm, or grasping a handhold on public transportation. Furthermore, many people worry that underarm odor could spoil a first impression or damage an existing good impression that others may have of them (2014 Lion Survey). Now, from the popular Ban block roll-on line, Lion is releasing Ban Odor-Blocking Roll-On. The nano ion antibacterial agent in this new antiperspirant and deodorant stays on skin longer for lasting freshness, even at the most odor-prone moments. Ban Odor-Blocking Roll-On offers women a way to forget about underarm odor and stay positive all day. Fixing agent adheres firmly to skin and forms an adhesive veil, effectively holding the antibacterial agent (benzalkonium chloride) in place.